DETROIT, MI [COCC] -- The Council of Orthodox Christian Churches of Metropolitan Detroit (COCC) will sponsor its third annual "Christ is Born! Glorify Him! A Detroit Orthodox Christmas Concert" on Sunday, Dec.10 at 6 p.m. at St. Mary the Protectress Ukrainian Orthodox Cathedral, 21931 Evergreen Road (between Eight and Nine Mile roads), Southfield, 48075. 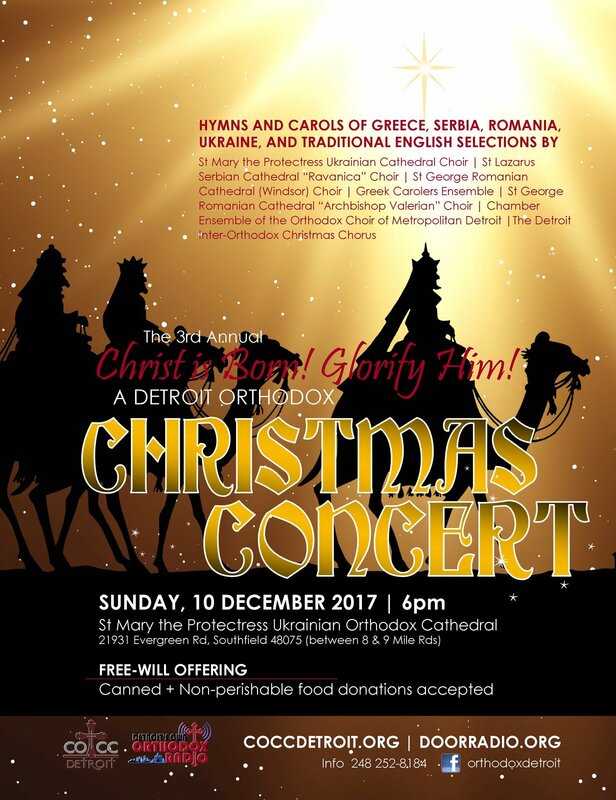 The first part of the concert will feature Nativity hymns and carols from Greece, Romania, Serbia, Ukraine and other lands sung by selected choirs from local Orthodox churches, including St. Mary the Protectress; St. George Romanian Orthodox Cathedral, Southfield; and St. Lazarus Serbian Orthodox Cathedral, Detroit. An oratorio-style narration will connect the performances in the concert. The second part will feature English-language hymns sung by the participating choristers with members of the Orthodox Choir of Metropolitan Detroit and a sing-a-long of popular carols. An afterglow reception will follow. A freewill offering will be collected during the concert, and attendees are invited to bring canned and non-perishable food for donation to Orthodox Detroit Outreach Community Pantry at Gilbert and Clayton streets.